Back in the day in primary school you had the “3R’s” (Reading, writing, and arithmetic), which together represented the three essential elements of a 3-legged educational tripod. Learn all three, and you had a firm foundation in the basic skills necessary for all future learning. Take one or more of these elements away, and your educational foundation was shaky at best. Similar to the 3R’s of education, in its capacity as one of the primary connection and conversion engines of digital marketing, SoLoMo enjoys its own version of the 3R’s which together represent each of its three essential elements: Reach, Relevance, and Resource. Social – Provides the Reach sought after as brands try to activate customers to share coupons, deals, promotions, and positive experiences with the brand through their social networks. Local – Provides the Contextual Relevance that allows brands to target nearby consumers with coupons, offers, deals, etc., and for nearby consumers to find the same. Mobile – Provides the channel Resource necessary for brands to communicate coupons, deals, promotions, and information to nearby consumers, and for consumers to find the same. SoLoMo integrates social reach and contextual relevance through an always-on channel resource to create omnichannel experiences that facilitate efficient two-way value exchanges between the consumer and the brand. Take one or more of these elements away, and the entire system begins to falter. In early 2014, IBM Institute for Business Value published the results of a far-ranging study of over 30,000 consumers in 16 countries to see how far along mass consumer adoption of the omnichannel (SoLoMo) shopping experience had come. Traditional (19% of study population) – Uses the least amount of technology while shopping. Transitioning (40%) – Uses technology mostly to gather research and other information. Tech-intrigued (29%) – Uses SoLoMo from browsing to buying. Trailblazers (12%) – Uses SoLoMo extensively, including as a retailer evaluation tool. No surprise, the early adapters of SoLoMo, the aptly named “Trailblazers,” stood out based on their high expectations that retailers provide SoLoMo capabilities. 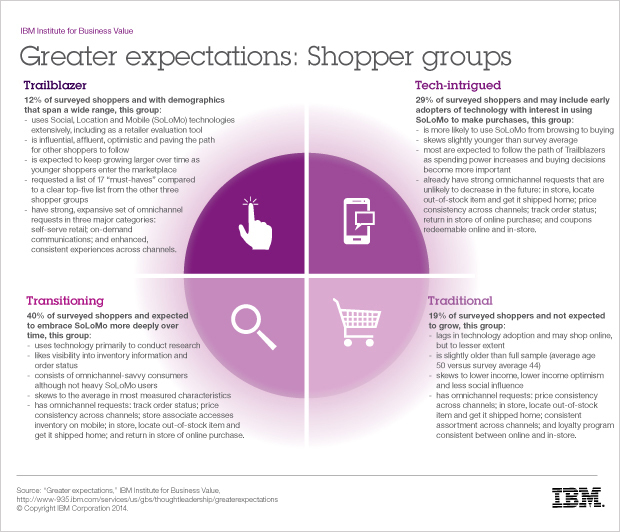 Significantly, IBM concluded that of all four groups studied, the experience of Trailblazers represented the future of shoppers. IBM also concluded that it is only a matter of time before many in the middle two groups (“Transitioning” and “Tech-intrigued,” together representing 69% of respondents) have the same level of expectations as Trailblazers. When taken as a whole, the findings of the IBM study offer a simple heads up to businesses, especially retailers: You better embrace SoLoMo, and fast. Though in the early stages of mainstream adoption, SoLoMo has already begun to redefine marketing as we know it; brands of all shapes and sizes – from swanky Manhattan art galleries to global technology supergiants – are employing SoLoMo best practices to provide the very omnichannel experiences that increase connection and conversion. As reported in an article in Entrepreneur, Brentano’s is a custom framing shop and art gallery in Manhattan’s SoHo neighborhood which has traditionally relied on word-of-mouth to drive revenue; in fact, owner Joseph Brentano calculates that 85% of his sales are from referrals or repeat customers. To bring in more traffic to its shop/gallery, Brentano’s partnered with Kapture, a mobile marketing platform that rewards users for sharing photos from local businesses on social media. Now any iPhone owner who snaps a picture inside Brentano’s and uses Kapture to post the image to a Facebook or Twitter account receives a 15% discount on their next framing order. A picture used to be worth 1,000 words, now it’s worth 15% off. As reported in an eMarketer post, in late 2012, Samsung ran a SoLoMo campaign to try and bring local shoppers into physical retail stores to experience the company’s new smart TV and then share their experiences through their social networks. Samsung partnered with Angry Birds to demonstrate how motion and voice control work on the Samsung smart TV. The campaign goal was to get consumers in stores and playing Angry Birds on its new smart TVs. Mobile technology platform JiWire delivered location-specific ads to consumers’ mobile phones when they were either in-store or within a 5-mile radius of a store. For the latter group, the ads included the name and address of the closest store, so shoppers could access directions from their current location with one click. The ad encouraged users to visit local retail stores to experience Angry Birds on the Samsung Smart TV. It also incorporated check-in buttons so that consumers could share their location and experience on social media. Moreover, by checking in, users could also enter a sweepstakes to win a Samsung Smart TV. Samsung’s agency, Starcom, had plenty of data points to measure results, including consumer engagement with the mobile ad, clickthroughs, the number of consumer actions taken, and retail store traffic; they could also measure social engagement through Facebook check-ins, social sharing, sweepstakes entries, and in-store experience surveys. Overall, the SoLoMo campaign far exceeded expectations. Even though we’re still in the early stages of SoLoMo adoption, SoLoMo has already become impactful enough to inspire a summit and a song. Ah the power of SoLoMo; redefining marketing, one check-in at a time. How can your brand use SoLoMo to connect and convert your target audience, both in-store and online? Given that the “Local” proximity element of SoLoMo can also imply online proximity rather than strictly physical in-store proximity, how can brands leverage SoLoMo best practices to connect with and convert their target audience via online channels?